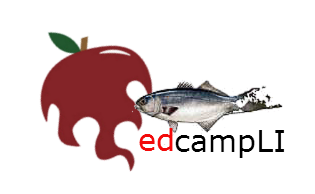 Perhaps only an EdCamp could inspire educators to dedicate a September Saturday to vigorous professional development. Despite the bustle of back-to-school work — and the ache to cling to summer's penultimate weekend — several hundred teachers and parents convened yesterday for the inaugural EdCamp Long Island event at the Willets Road School in Roslyn Heights, NY. Following the mold of the EdCamp movement, this “unconference” featured a roster of organically generated sessions. Rather than being tethered to a prefab schedule of speakers, participants at #EdCampLI could join conversations posted by like-minded souls on a wall-size chart of sticky note suggestions. Not surprisingly, many of the workshops centered around technology. We were intrigued by Voxer in its combination of voice, text, and photos. We were also excited to try TodaysMeet as an easy backchannel for student questions and feedback. Our two favorite sessions, however, had little to do with edtech and everything to do with communication and leadership. The meeting about “Transformational Leadership In The 21st Century School" with Dr. Sheilah (@docsheilah) demonstrated a host of tried and true ideas built around the philosophy that just because it’s always been done one way, it doesn’t mean you can’t step back and rethink the purpose. Imagine faculty meetings where the administrators make their own simple “TED” style talks to promote discussions, or an a la carte menu of meeting topics from which teachers get to choose. This forward-thinking approach made it clear that in this type of school, the administrators model the concept of "lead learners." The round-table discussion on “Fostering 2 Way School-Home Communication” gathered thoughtful teachers and parents who were genuinely motivated (and at times frustrated) in getting school constituencies on the same page. The small-group seminar was organized by principal Dennis Schug (@DJrSchug) of Hampton Bays, NY, and parent Gwen Pescatore (@gpescatore25) of Philadelphia, PA (and #PTchat). The unstructured confab yielded honest questions about the most efficient technologies for communication and the barriers to inclusivity in PTO meetings. There were also creative strategies to welcome non-English-speaking families and adults intimidated by social media. In fact, the day’s free-flowing learning made us realize that regular faculty meetings could be better structured like an EdCamp. They could involve authentic colloquies spawned from the bottom-up. They could welcome differentiated dialogues initiated by teachers themselves, rather than administrative decrees. Even more, our classrooms could become miniature EdCamps. We could do more to solicit interest from the students themselves, to invite direction based on kids’ curiosities and passions. Our daily lessons could embrace the messy beginnings of finding a path and honing an objective. In the end, we would probably still nurture the same key skill sets. But we would reach our goals by letting the children themselves scribble post-it notes of wonder and glom onto subjects that matter not to us, but to them. If you were unable to attend, here is the Google Doc of session notes from Saturday. Also, the hashtag #EdCampLI captured all of the lively exchanges and resources. Many thanks to the organizers who staged yesterday's event, and we look forward to EdCampLI 2.0 next year. Gnawing at the edtech underbelly is the unshakable worry that today's digital stampede may not be helping the herd. 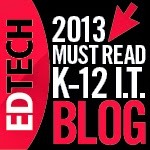 It is unquestionable that apps and devices are changing education. But the question remains: Are they genuinely building better students, sharper thinkers, and smarter learners? Or is the edtech "revolution" an example of change-for-change's-sake, when newfangled glitz replaces traditional tools that worked just fine? 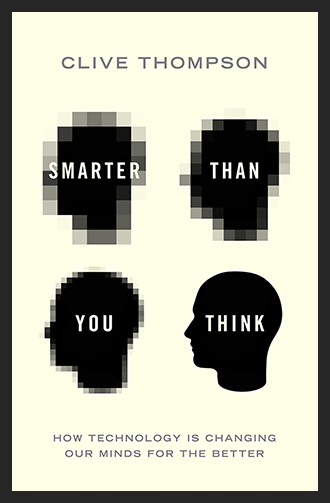 Clive Thompson makes the compelling case in his book, Smarter Thank You Think (Penguin Press, 2013), that technology is indeed transformational for the good of humankind. Thompson posits that the evolving hybrid of mind and machine is generating a new species. This potent beast is greater than the sum of its parts, strong and nimble in combining the best of the human brain and the efficiency of computational thinking. Thompson calls this new cognitive animal "the centaur." 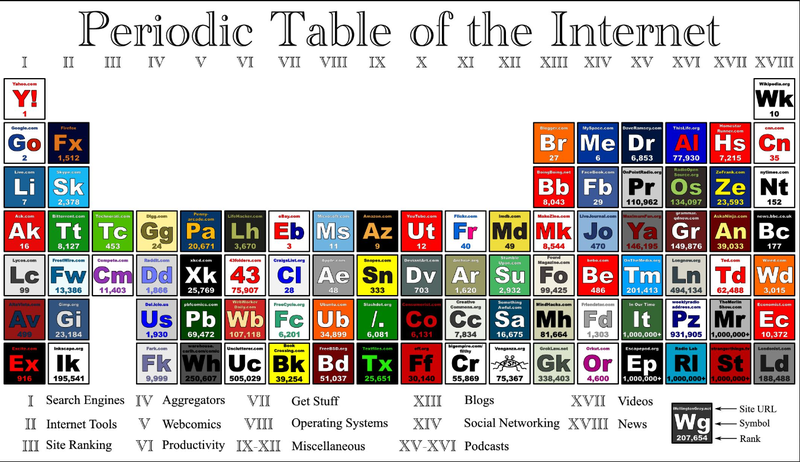 The metaphor of the centaur is perhaps more approachable for classroom teachers than the tiered SAMR model or the complicated Periodic Table Of The Internet. The daily marriage of student ingenuity and digital possibility can spawn a creation that would have been impossible before the advent of 1:1 technology. One of the clearest examples of higher-level, centaurian potential is Padlet. 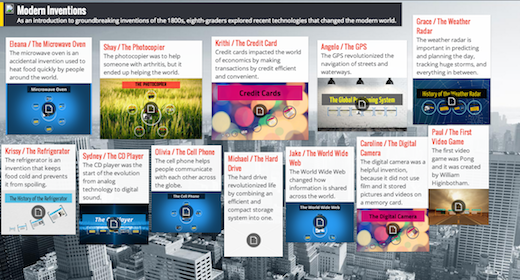 This Web 3.0 resource combines an interactive, collaborative doc with a customizable, embeddable canvas to offer students avenues for publishing and sharing that were unimaginable only a few years ago. Formerly known as Wallwisher, Padlet underwent a winning redesign to enhance its flexibility and usability. 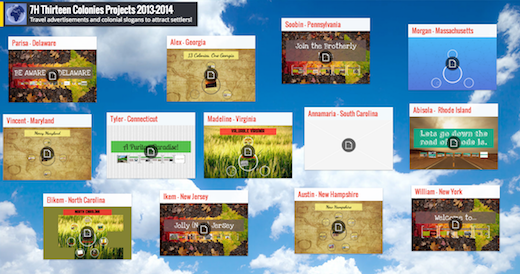 Padlet allows learners anywhere to share ideas on a cooperative whiteboard. 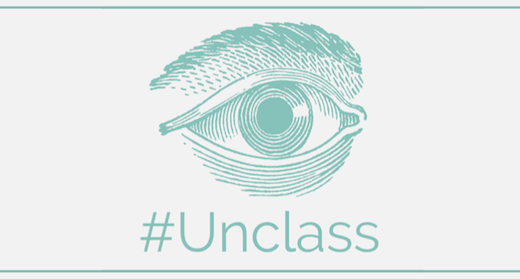 The design options offer a host of backgrounds and icons, and each url can be personalized to suit the class. 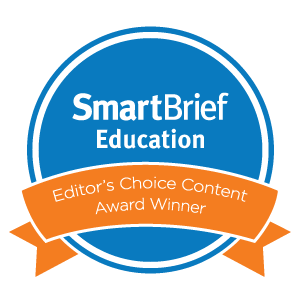 Best of all, the "smart" space welcomes any web link and transforms it into a clickable image or video that can be accessed without ever leaving the Padlet world. Padlet accepts all embed codes, so third-party media and flipped videos are easily extended to students. 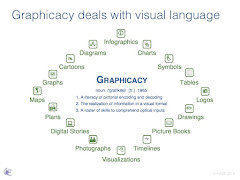 Furthermore, it permits learners to broadcast their projects, posted online for peers to appreciate and internalize. Ultimately, Padlet is a daily tool. Kids can ask questions anonymously. They can post homework responses. They can share links to current events. They can document notes from the day's lecture. They can elevate their regular thought processes to a fusion of technology and partnership, in which the new mutant creature is more beneficial and compelling than the pre-digital brute. With the constant discussion in the news about the high-tech use of social media by the terrorist group ISIS (Islamic State in Iraq and Syria) to recruit members from around the globe, we know that many of our learners will have questions as we head into the new school year. National newspapers show armed police in public places, and the threat of homegrown terrorism is a daily conversation from the networks to the Congressional floor, no matter what the media. While we don’t want to make the discussion of terrorism a routine part of our classes, we do know that providing ways for students to process and understand what they see and hear can ease anxiety. 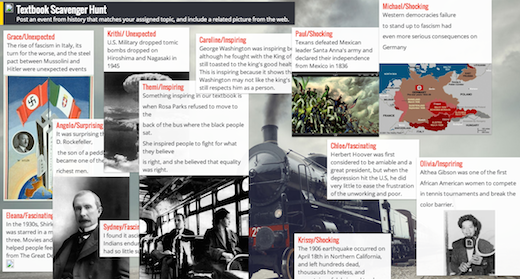 Giving them concrete ways to visualize information provides opportunities to decipher the constant bombardment in the news on the subject. 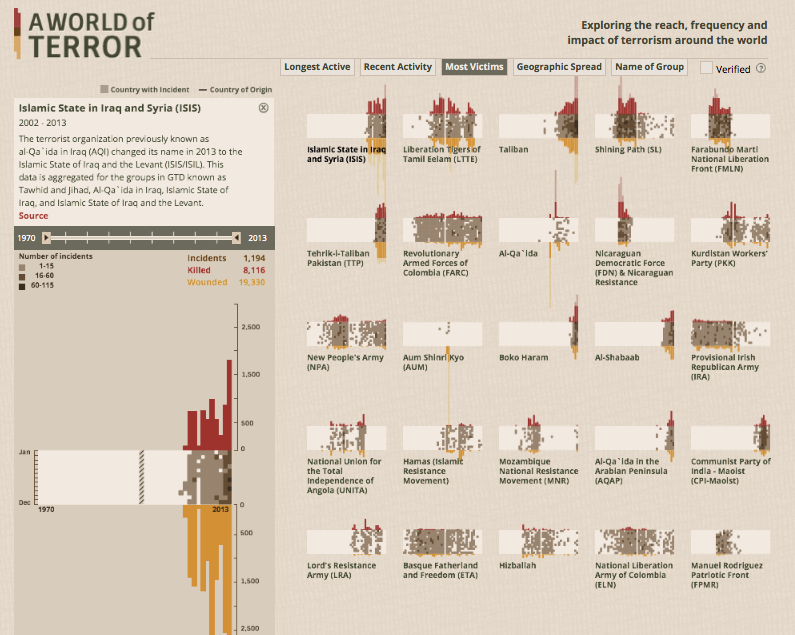 The World of Terror was produced by Periscopic to visualize the University of Maryland’s Global Terrorism Database that catalogs terrorism events from 1970 to 2013. It is a fascinating interactive view that adjusts depending on the categories, including longest active group, recent activity, victims, geographical spread, and name of group. It’s color coded to show the number of incidents, and a click on the map provides more information depending on the selection criteria. 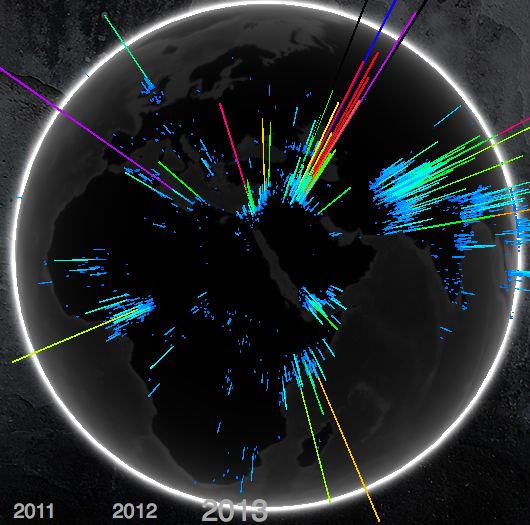 The GTD WebGL Globe from the University of Maryland is an interactive geographic visualization that plots location and frequency. 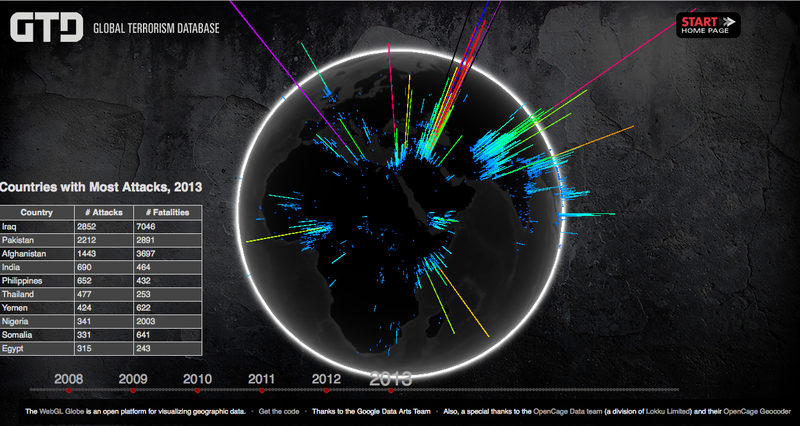 The timeline of incidents sparks at different lengths in a neon show to pinpoint sites on a darkened globe. The globe itself can be rotated to view each year and the number of incidents that have occurred. 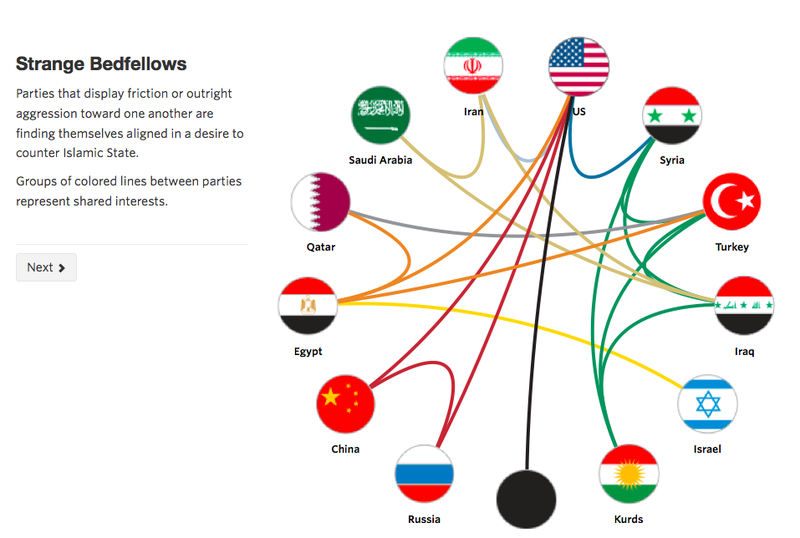 The last interactive graphic called Strange Bedfellows was produced by The Wall Street Journal. It shows how the spread of ISIS may be pushing enemies often at odds with each to work together against a common enemy. The educational process is not just the prescribed curricula; it's about the need to help our learners understand to the world around them. 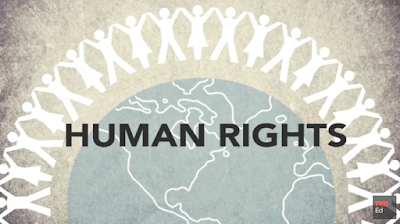 Anytime we can provide multiple views to help them comprehend the complexities of world politics, the better off they are at making informed choices as young adults.